بِسْمِ الله وَبِالله وَتَوَكَّلْتُ عَلى الله إنَّهُ مَنْ يَتَوَكَّلْ عَلى الله فَهوَ حَسْبُهُ إنَّ الله بالِغُ أمْرِهِ قَدْ جَعَلَ الله لِكُلِّ شَيٍ قَدْراً، اللّهُمَّ اجْعَلْني في كَنَفِكَ وَفي جِوارِكَ وَاجْعَلْني في أمانِكَ وَفي مَنْعِكَ. Dua’a 261 To relieve pain in any part of the body (if Allah wills) recite surah al fatihah 70 times (or 7 times), keeping the mouth nearest to the forehead of the sufferer. It is a sure cure of every ailment except the deadly disease (through which death has been decreed). Dua’a 262 Whosoever recites surah al Nahl once in a month, Allah will keep him safe, if He wills, from many diseases, some of them are leprosy and insanity. Dua’a 263 Write surah al Shu-ara with the solution of musk and saffron on a china plate, wash it with pure water and drink it. If Allah wills, He will heal you from whatever illness you are suffering from. Dau'a 264 Whosoever recites surah YaSin daily, or once in a weak or a month or at least once in a lifetime, Allah, if He wills, will keep safe from every disease that may inflict him/her. Dua’a 265 Whosoever writes surah Muhammad and keep it as a ta’wid’ on the body,. Remains safe from every kind of illness. Dua’a 266 Whosoever recites surah Hadid and Mujadilah in every obligatory salat, Allah, if He wills, will not allow any detestable disease to afflict his/her body. Dua’a 267 To relieve pain and suffering in any part of the body keep the written text of surah al Mujadilah on the body. Dua’a 268 If surah al Quraysh is recited over the food, before eating, it will not only be rendered harmless but also act as a healer of any illness you are suffering from. Dua’a 269 (i) There are several ahadith (traditions) in Tufatuz Za-ir, Safinatun Najat that the earth of Karbala (from the precinct of the resting place of Imam Husayn), known as khak shifa, cures every ailment save the deadly disease (by which death has been decreed). It is written in Zad al Mi-a'd that the Holy Prophet told his companions to carry out (the following procedure) in order to cure and heal whatever type of pain or illness is afflicting a person. (1) Obtain rain water of spring (ab naysan) in the month of April. (4) and drink it in morning daily for 7 consecutive days. O Allah, I beseech You in Your name with which if any one in distress beseeches You, You remove from him that which troubles him and let him stay on the earth, make him Your representative over Your creation; so, send blessings on Muhammad and on the children of Muhammad and the people of his house (Ahl ul Bayt) and cure me of my illness. Then sit straight, put the wheat before you and recite the above dua again, divide the wheat in four equal parts, and give each part to a needy person, then again recite the (above noted) dua’a. In the name of Allah, the beneficent, the merciful. Praise be to Allah, the Lord of ht eworlds. Allah is sufficient for us, (He is our) most excellent protector. Blessed be Allah, the best of creators. There is no power, nor strength (with any one) save Allah, the highest, the great. To prevent relapse recite this dua’a as stated above for three days. Imam Jafer bin Muhammd al Sadiq, Safinatun Najat mentions, advised one of his children to recite the following dua’a which is a remedy, if Allah wills, for whatever pain of ailment a person is suffering from. O Allah, make me healthy with Your remedy, cure me with Your medicine, keep me safe from the misfortunes (with which You try me), because verily I am Your servant, the son of Your servant. Whosoever is suffering from whatever ailment, will become healthy, if Allah so wills, after reciting the following dua’a, according to Imam Muhammad bin Ali al Baqir, says Hulyatal Muttaqin. In the name of Allah, for Allah, blessings of Allah be on the Messenger of Allah and on his children. I take refuge with the might of Allah and His power from the evil He may like to afflict me with, which tortures me. O Allah I beseech You to give me health and happiness at the earliest, make me survive misfortunes, and let me depart from the world (only) unto Your mercu. Allah, Allah, (He is really) my Lord, I do not associate anything with Him. O my Allah, You have total power over it and all like it, so separate it from me. Imam Jafar bin Muhammad al Sadiq advised his companions to recite the following dua’a after any wajib salat of the day to heal any ailment. In the name of Allah, for Allah, how many a blessing of Allah is there in a vein or a sinew, stationary or non-stationary for a person grateful or ungrateful. O my Allah, remove from me my pain and anguish, make me well soon, drive away distress form me. We sent down the Quran which is a healing and a mercy for the believers; but it adds nothing for the unjust but perdition. It is written in Misbah Kafa’mi that if a child is sick (suffering from any illness0 his (or her) mother should recite the following dua’a, standing under the sky, bare headed. O my Allah, You (always) bestow benefits on me, You give me (many) grants, so O my Allah, now give me Your grant today again, for verily You are the most capable and all powerful. Imam Ali ibn abi Talib advised one of his companions to recite the following dua’a to cure any disease of Allah so wills. I seek refuge with the might and power of Allah He has over (all) things. I give my soul in protection of (Allah) who keeps the sky in place. I leave my soul to (Allah) to take care of it because when His name is pronounced no disease can harm. I give my soul in protection of (Allah) because His name gives in return well-being, health and happiness. Imam Ali bin Musa al Riza prescribed the following ta’wiz for cure of all sorts of pains. Write it on a sheet of paper with the solution of saffron and rose water, and wear round the neck or on the upper part of the right arm. I seek protection for myself from the Lord of the heavens and the earth. I seek protection for myself from Him who is such that when His name is mentioned no ailment can give trouble. I seek protection for myself from Allah whose name cures and gives blessings. According to Sayyid ibn Tawus the following dua’a should be written on a sheet of paper and used as a ta’wiz to cure any illness. O He whose name is a remedy, whose remembrance is a cure, who causes recovery on account of whatever He likes from any thing. Send blessings on Muhammad and on the children of Muhammad and let me get rid of this ailment on account of Your name. To cure any ailment the following dua’a is mentioned in Sahifa Alawiyya, by Imam Ali ibn abi Talib. O my god, whenever You bestow a favour on me, my thankfulness to You is not as much as it should be; whenever any misfortune afflicts me, my endurance falls short of the requisite. So You are He who did not forsake me even though my thankfulness in return of Your favour was insufficient; You are He who did not abandon me even though my endurance in the hour of misfortune was inadequate; You are He who did not disgrace me even though You saw me doing evil deeds; You are He who did not punish me even though You noticed every sin I committed, so send blessings on Muhammad and on the children of Muhammad, forgive my sins, cure my ailment verily You have power over all things. To cure any ailment recite the following dua’a on an apple and give it to the patient to eat it before breakfast. O light of all things, which guides everything. You are He who splitted darkness by His (Your) light. To cure any disease make a vow that if the ailing person gets well, 1400 or14000 salawaat will be recited for Imam Musa bin Jafar al Kazim. O Allah, send blessings on Muhammad and on the children of Muhammad. Imam Ali ibn abi talib advised his companions to recite the following dua’a thrice a day to cure any disease. Allah is eternal, everliving; He removes suffering; He is self-subsisting, ever-existing by His eternity, neither perishes nor ceases to exist. By Your mercy, O the most beneficent. Imam Jafar bin Muhammad al Sadiq advised his followers to recite surah al lkhlas 1000times, then beseech Allah in the name of Fatimah Zahra, to cure any type of fever, if Allah wills. Imam Jafar bin Muhammad al Sadiq advised his followers to write Ayatul Kursi (see dua’a 39 on page 43) with saffron on a clean china plate, wash it with pure water and drink it to cure any type of fever, if Allah wills. I give my self in the protection of Allah on account of His honour, power, greatness, sovereignty, beauty, and the party of Allah, and the messenger of Allah and his children (blessings of Allah, be in his and on them), and those who exercise authority (on Allah’s behalf) to enforce His commands, from every evil of which I am afraid. I bear witness that verily Allah had power over all things, there is no might nor power (with any one) save with Allah, the highest, the greatest. Send blessings on Muhammad and on his children, O my Allah, and cure me with Your remedy, restore me to health with Your medicine, keep me safe from every misfortune. Imam Jafarbin Muhammad al Sadiq advised his followers to write the following verses of the Holy Quran on a sheet of paper and wear it as ta’wid’ around the neck to cure any type of fever, if Allah wills. We sent down the Quran which is a healing and a mercy for the believers. Muhammad is the messenger of Allah; and those who are with him are sever against infidels but prostrating, seeking His grace and pleasure. Their mark is on their faces (foreheads) from the effect of prostrations. (Such is) their description in the Tawrat, and their description in the Injil. And giving the glad tidings of a messenger who shall come after me, whose name is Ahamd.” Yet when hw came to them they said: “This is manifest sorcery. Bismillaah (in the name of Allah) is written on the shank of Arsh (the throne of authority). Imam Ali bin Musa al Riza advised his followers to write the following verses of the Holy Quran on separate sheets of paper, bind then as a ta’wid’, and put round the neck. Also recite surah al lkhlas 3 times after writing every sheet. Fear not. Verily you shall be successful. (Taha : 68). Imam Hasan bin Ali al Askari advised his followers to write the following verse of the Holy Quran on the hide of a deer and bind it as a ta’wid’. 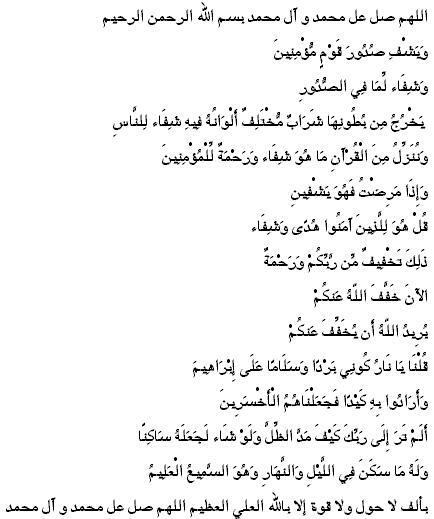 The following dua’a was given to Imam Ali ibn Talib by the Holy Prophet to cure fever, if Allah wills. O my Allah have mercy on my tender skin, my intricate bones. I seek Your protection from the heat of burning flames. O fever, if you accept Allah’s (authority), do not devour (my) flesh, nor drink my blood, nor be fierce in (my) anguish, but go to a disbeliever who believes that there is another god save Allah, the One, and that Muhammad is His servant and His messenger. Blessings of Allah be on him and on his children. Bibi Fatima Zahra taught the following dua’a (known as dua’a Noor Saghir (small), to Salman Farsi to cure fever, if Allah wills. It should be recited as well as kept on the body as a ta’wid’. In the name of Allah, the light. In the name of Allah, the light of light. In the name of Allah, light over light. In the name of Allah who regulates the affairs. In the name of Allah who created light from light. Praise be to Allah who created light from light, sent down light on the mountain (Tur), on bayt al ma’mur (the house in haven above the Ka’bah) on the raised ceiling, as well as in the book written on the stretched parchment in measured quantity, and on the blessed prophet. Praise be to Allah who is remembered with admiration, who is well-known for (His) glory, who is thanked in bliss as well as in misery. Blessing of Allah be on our master, Muhammad, and on his pure and chaste children. To cure fever recite the following dua’a and blow breath in the patient. The creation of the heavens and the earth is indeed greater than the creation of mankind but most people do not know. Then look again. Do you see any fissure? Turn your eyes again and again, your gaze shall turn back dulled and tired. Blessings of Allah, the highest, be on his “the best creation”, our master Muhammad, and on his children. It is written in Hulyatul Mattaqin to write the following verses of the Holy Quran on a sheet of paper and bind it as a ta’wid’ on the right arm of the patient who is suffering from shaking fever. Inshallah the fever will come down. Yet He has made a barrier between them and an impassable partition. Be it known, verily the party of Allah alone shall be victorious. Verily Our word has already gone forth about our servants, the messengers. And Our hosts, they verily will be victorious. Say ‘Alayhis salam Whenever you read or say the name or any epithet or appellation of any Imam of the Ahl ul Bayt, any prophet or messenger of Allah, and any distinguished member of the family or the Holy Prophet. Say:‘ Salawatullahi’alayha Whenever you read or say the name of Fatimah Zahra, Khadija Kubra, Zaynab binti Ali, Maryam and Asiya.